Photographic lighting is a topic that will never go out of style, no matter how sophisticated cameras and other technology get. Even with the most high-tech gear, photographers still need to put a lot of thought and vision into lighting their photographs in order to get great results. This key skill has the power to dramatically and quickly improve photographs. 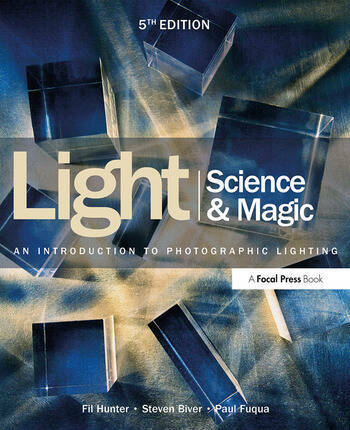 Light Science and Magic provides you with a comprehensive theory of the nature and principles of light, with examples and instructions for practical application. Featuring photographs, diagrams, and step-by-step instructions, this book speaks to photographers of varying levels. It provides invaluable information on how to light the most difficult subjects, such as surfaces, metal, glass, liquids, extremes (black-on-black and white-on-white), and portraits. All new chapter titled "Setting Up Your New Studio"
A re-vamped and expanded chapter 8 now titled "Making Portraits"
Styles of lighting continue to change, but the nature of light will always remain the same. Once photographers understand the basic physics of lighting, they can apply that knowledge to a broad range of photographic styles. What Are the "Principles?" Why Are the Principles Important? How Did We Choose the Examples For This Book? What Lighting Equipment Do I Need?What Else Do I Need to Know to Use This Book? What Is the Magic Part of This Book? Where Else Do These Techniques Apply? Broad Lighting or Short Lighting? Why Is the Color of the Light Important? Light Modifiers – Which Do I Need? Fil Hunter was a highly respected commercial photographer specializing in still life and special effects photographs for advertising and editorial illustration. During a career spanning over three decades, he worked for such clients as America Online, US News, Time-Life Books, Life Magazine (27 covers), the National Science Foundation, and National Geographic. He taught photography at the university level and served as technical consultant on a number of photographic publications. Mr. Hunter won the Virginia Professional Photographer's Grand Photographic Award three times. Steven Biver has over twenty years of experience as a commercial photographer specializing in portraits, still life, photomontage, and digital manipulation. His client list includes Johnson & Johnson, USDA, William & Mary College, Conde Nast, and IBM. He has been honored with awards from Communication Arts, Graphis, HOW Magazine, and Adobe, who have also included his work on a Photoshop 'extras' disc to inspire other photographers. He is also the co-author of FACES: Photography and The Art of Portraiture, another Focal Press publication. Paul Fuqua has worked as an editorial and wildlife photographer for more than thirty-five years. He started his own production company in 1970 and is dedicated to teaching through the use of visuals. Paul has written and produced educational and training material in a variety of fields including law, public safety, history, science, and the environment. For the last ten years he has produced educational material dealing with the natural sciences and the need for global habitat stewardship. Paul is also a co-author of FACES: Photography and The Art of Portraiture for Focal Press.